The gastrointestinal tract is the largest lymphoid organ in the body. The environment to which this immune system is exposed is filled with foreign antigens that must be sorted, identified, and, if necessary, reacted to. Thus, it is not surprising that intestinal dysfunction may develop in patients who are immune deficient, particularly those with IgA deficiency, because IgA is the most important immunoglobulin of the intestine. Some patients who have one of the hypogammaglobulinemic syndromes may experience malabsorption.36 Patients with IgA deficiency also usually have a history of recurrent respiratory infections,36 which further distinguishes them from patients who have gluten-sensitive enteropathy. The most common cause of malabsorption seen in this condition is giardiasis. Diagnosis The diagnosis of hypogammaglobulinemic sprue is suspected if the patient has signs and symptoms of malabsorp-tion and low levels of serum immunoglobulins, especially IgA. 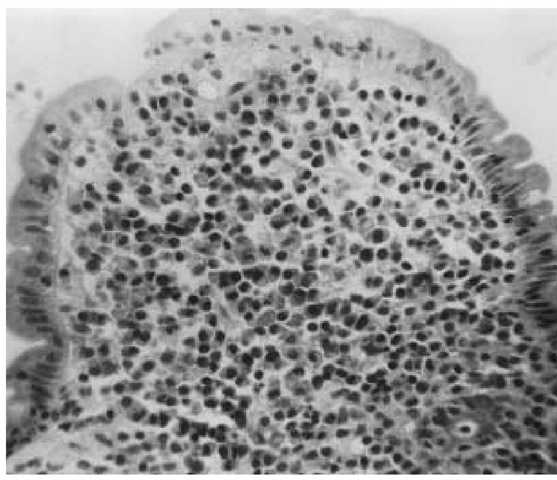 Intestinal biopsy specimens lack plasma cells and thus are easily distinguishable from those of patients with gluten-sensitive enteropathy, in which plasma cell types are abundant. Plasma cells are readily seen in normal biopsy specimens as well. Giardia lamblia organisms may also be present in hypogammaglobuline-mic sprue. Treatment Frequently, the intestinal symptoms associated with hypogammaglobulinemic sprue improve if metronidazole is given at 750 mg/day for 10 days to treat giardiasis. Massive small bowel resection is used to treat various diseases, including mesenteric ischemia, volvulus, and Crohn disease. Because the intestine requires a certain surface area over which absorption can occur, reducing the area below a critical value results in malabsorption. Depending on the amount of bowel resected, the results can range from mildly inconvenient to catastrophic. Retention of the ileocecal valve lessens symptoms. The ileum responds to jejunal resection by hyperplasia much more effectively than the jejunum responds to an ileal resection. There are also specialized mechanisms present in the ileum that are not available to the jejunum, such as bile salt and vitamin B transporters. The maintenance of an adequate bile acid pool is important for fat absorption because the reduced absorptive surface area in patients who have undergone bowel resection makes it necessary for fat absorption to be as efficient as possible. Alternatively, the ileum can perform most of the functions of the jejunum except for folic acid, Ca2+, and Fe2+ absorption. However, these can be replenished by appropriate medication. Diagnosis The diagnosis of short bowel syndrome is made by a history of bowel resection in combination with clinical manifestations of the syndrome, such as diarrhea, steatorrhea, weight loss, trace-element deficiencies, hyponatremia, and hypokalemia. Treatment Treatment of patients with short bowel syndrome depends on the part and the amount of the bowel that has been resected. Protein requires the greatest surface area for absorption.37 Thus, achieving adequate assimilation may become problematic, despite the water solubility of proteins and their hydrolytic products. Vitamins and minerals also need to be added to any therapeutic regimen, depending on what part of the bowel is missing. Treatment can include eating multiple small meals each day, eating quickly absorbed foods such as canned caloric supplements, having food finely chopped or ground, and eating foods containing medium-chain triglyc-erides, which can be absorbed in the absence of bile salts.37 Foods rich in polyunsaturated fatty acids, such as vegetable oils, are more easily absorbed than meats, which have more saturated fat. Finally, completely hydrolyzed dietary supplements are rapidly absorbed. To slow bowel transit, diphenoxylate-atro-pine, loperamide, or deodorized tincture of opium can be used effectively. An alternative method is to have the patient drink a small amount of safflower oil just before a meal. The lipid quickly goes to the ileum (if present), the colon, or both38 and elaborates peptide YY (PYY),39 which is the putative ileal break, slowing gastric emptying. Having patients try different diets will often enable them to ingest food orally rather than receive total parenteral nutrition (TPN), which is less desired. Injury of the intestine is an all too common result of delivery of ionizing radiation as oncologic treatment. Injury to the small bowel is more common if the patient has had previous abdominal surgery, which may restrict the movement of the small bowel. The terminal ileum may become involved during pelvic irradiation. To prevent radiation injury, it may be advisable to irradiate patients on a turntable so that more than one part of the intestine receives the maximal amount of radiation. Whipple disease is a rare multisystem disease caused by the bacterium Tropheryma whippelii.40 The pathogenesis is obscure. The bacillus may be widespread throughout the body, but the sites of invasion show little sign of inflammation, suggesting that an autoimmune deficiency may create a predisposition to the disease.41 Accurate diagnosis is imperative because mortality approaches 100% without antibiotic treatment. Clinical manifestations Classically, Whipple disease begins in a middle-aged male with a nondeforming arthritis that usually starts years before the onset of the intestinal symptoms. Arthralgias, diarrhea, abdominal pain, and weight loss are the cardinal manifestations of Whipple disease. Other complaints include fever, abdominal distention, lymphadenopathy, hyperpig-mentation of the skin, and steatorrhea.42 Many patients express the HLA-B27 isotype. Occasionally, intestinal symptoms are absent, even in some patients with central nervous system involve-ment.43 In a well-documented but unusual case, intestinal involvement was not identified, even after extensive biopsies in two laboratories, despite the fact that the patient otherwise had typical symptoms of the disease.44 Cardiac and pulmonary involvement may also be found. Laboratory tests The recognition of Whipple disease in patients without intestinal symptoms or involvement by the disease has been increasing since the advent of polymerase chain reaction techniques that identify the unique 16S ribosomal RNA of T. whippelii. The diagnosis rests on identifying the classic periodic acid-Schiff (PAS)-positive macrophages, which contain sickle-form particles.42 By far the most common site of biopsy that yields positive results is the intestine. Figure 6 Small intestinal biopsy specimen from a patient with primary intestinal lymphoma shows a single broadened villus (magnification: 400x). The epithelium is composed of normal columnar cells, but the lamina propria is packed with plasma cells and other mononuclear cells. Surgical biopsies in this patient revealed evidence of generalized subepithelial histiocytic lymphoma. The histologic lesion shows distended villi (clubbed villi) filled with the foamy, PAS-positive macrophages and lymphatic dilatation. A flat villous surface can be seen in extreme cases. These findings need to be differentiated in the appropriate clinical setting from those of M. avium complex disease, in which PAS-positive macrophages are also found. A stain for acid-fast bacilli should differentiate between them. Central nervous system involvement, occasionally associated with typical macrophages in the cerebrospinal fluid as substantiated by the more sensitive PCR technique, may be present in the absence of neurologic symptoms,47 and a negative result on PCR may predict a low likelihood of clinical relapse.48 Occasionally, a brain biopsy is required, which can be guided by magnetic resonance imaging. Treatment Because Whipple disease is so uncommon, a well-defined treatment plan is difficult to establish. The originally proposed treatment was penicillin (250 mg q.i.d.) and streptomycin (1 g I.M.) for 2 weeks, followed by tetracycline (1 g) for 1 year. Typically today, trimethoprim-sulfamethoxazole (one double-strength tablet b.i.d.) is given for 1 year. All antimicrobial agents are used in customary doses. Although the intestinal and systemic symptoms respond readily to either treatment, the major concern is treatment of CNS manifestations. Usually, in those patients who do not have CNS involvement initially, CNS symptoms appear a year or more after treatment of the systemic and intestinal symptoms, especially if an antibiotic is administered that does not cross the blood-brain barrier. A progressive dementia may be seen, but the pathogno-monic signs of CNS disease, when present, are oculomasticatory myorhythmia and oculofacial-skeletal myorhythmia.49 Antibiotics that cross the blood-brain barrier are therefore required. Interestingly, the short period of penicillin-streptomycin administration is enough to block CNS symptoms, whereas even long-term trimethoprim-sulfamethoxazole therapy occasionally may not prevent CNS manifestations of Whipple disease.50 Tetracy-cline alone does not eradicate CNS disease and should not be given by itself, even though it is effective in treating the intestinal and systemic symptoms. An important aspect to keep in mind is that in 50% of patients, the CSF may contain Whipple disease macrophages or PCR-positive material even in the absence of CNS symptoms.46 Once CNS involvement occurs, treatment is usually not helpful, although with treatment, some improvement may be noted and the disease may not progress. Intestinal lymphangiectasia is often a congenital condition in which deformed lymphatics impair the transport of chylomi-crons from the enterocytes to the mesenteric lymph duct. A similar pathophysiologic picture occurs in certain cases of IPSID, granulomatous enteritis, tuberculous enteritis, or Whipple disease in which normal lymphatic drainage is blocked. The blockage of lymphatic drainage may result in chylous ascites, chyluria, or chylometrorrhea.54 Protein-losing enteropa-thy and lymphopenia are prominent features. Modest steator-rhea is also present, with fat excretion commonly reaching 20 g/day. In the congenital form of the disease, lymphedema of the legs or of one leg and one arm is seen. With endoscopic examination, white villi, white nodules, and submucosal elevations may be noted.55 The white appearance of the mucosa is undoubtedly caused by retained chylomicron triacylglycerol. Double-contrast barium x-ray examination shows smooth nodular protrusions and thick mucosal folds without ulcera-tion.56 On histologic examination, dilated lymphatics with club-shaped villi are seen, sometimes in asymptomatic patients, in whom the outcome is benign. Treatment is directed toward any identified causative process. In patients with the congenital condition, in whom improvement of the lymphatics is not expected, a low-fat diet supplemented with medium-chain triglycerides is usually helpful. Surgery can be used to remove isolated areas of lymphatic dysfunction if these areas can be identified or to anastomose a lymph duct to the venous system. Sometimes a peritoneovenous (LeVeen) shunt is helpful. In addition to having intestinal symptoms, patients with abetalipoproteinemia have severe neurologic problems. These neurologic problems may be caused in part by essential fatty acid deficiency and in part by either the impaired delivery of lipid to nerves or an interference with the local synthesis of lipids. The result is a demyelinating condition that causes a sensory ataxia because of the loss of position and vibratory sensations. The symptoms are similar to but less severe than those of Friedreich ataxia.60 Patients may have muscle weakness and athetoid movements. Patients also experience retinitis pigmen-tosa, usually with mild loss of visual acuity but preservation of central vision. In addition to having neurologic abnormalities, patients have acanthocytes in their blood. Acanthocytes are spiculated red cells that have a near-normal life span but that demonstrate an increased susceptibility to mechanical trauma on in vitro testing. These patients have low plasma triacylglycerol and cholesterol levels. On histologic examination, the enterocytes are seen to be laden with fat. Despite this phenotype, the amount of stea-torrhea is modest (about 20 g/day). Abetalipoproteinemia is usually discovered in childhood because patients with the disease fail to thrive and have steator-rhea. In adults, the disease can be recognized by the combination of neurologic and ophthalmologic findings, the red cell morphology, the very low levels of plasma lipids, and the modest steatorrhea. On small bowel biopsy, the enterocytes are seen to be stuffed with lipid even after an overnight fast, indicating that the absorbed lipid cannot exit the enterocytes. Treatment should include vitamin E as well as the other fat-soluble vitamins and medium-chain triglycerides to reduce the steatorrhea, if required. Eosinophilic gastroenteritis is a rare disease that is characterized by the presence of eosinophilic infiltration of one or more portions of the gastrointestinal tract, anywhere from the esophagus to the colon, in conjunction with gastrointestinal symptoms. No identifiable cause of the eosinophilic infiltrate, such as parasitic infestation, is present. Many patients have an underlying allergic diathesis (e.g., hay fever, asthma, atopic dermatitis, or drug allergies). It is not known why eosinophils congregate in the GI tract in eosinophilic gastroenteritis, but evidence suggests that eosin-ophils, once activated, can produce cytokines that self-perpetuate the accumulation of additional eosinophils. These cytokines are interleukin-3 (IL-3), IL-5, and granulocyte-macrophage colony-stimulating factor (GM-CSF), which have been identified in eosinophils of patients but not in control subjects with irritable bowel syndrome. Local production of these cytokines is suggested by the finding that serum levels of IL-5 are normal in patients with eosinophilic gastroenteritis, in contrast to patients with the hypereosinophilic syndrome, who have increased levels of IL-5 in their blood. Although eosinophils are a normal constituent of the GI tract, in eosinophilic gastroenteritis the eosinophils appear more numerous than normal and are more invasive. For example, eosinophilic invasion of the crypts in the small intestine is a hallmark of eosinophilic gastroenteritis. A peripheral eosinophilia is often seen but is not always present. Eosinophilic gastroenteritis can be divided into two basic forms: a tumorous mass of eosinophils producing a granuloma-tous-type lesion and a more diffusely infiltrative form. In the former case, the lesions are most often in the distal stomach, which may produce obstructive symptoms, or the masses may be found in the more proximal stomach, small bowel, or colon. When lesions are in the small bowel or colon, the condition needs to be differentiated from a lymphoma or Crohn disease.63 In the case of diffuse disease involving the small bowel, the infiltration can be mucosal, with symptoms of protein-losing en-teropathy or malabsorption. If the infiltration is primarily in the muscle layers of the intestine, obstructive symptoms are common. Finally, the disease may be found in the subserosal area of the intestine, with resultant eosinophilic ascites. Most patients respond to conservative measures and steroids. Surgery should be avoided unless it is needed to relieve persistent or small bowel obstruction. Prednisone, 40 mg orally every morning and tapered slowly over 2 weeks, is the most effective therapy for patients with obstructive symptoms and ascites. If high-dose steroids are needed to maintain remission, azathioprine can be added for its steroid-sparing effect. Diet elimination therapy may be beneficial in patients with mucosal layer involvement. Crohn disease with malabsorption is suggested by the history (e.g., a prior ileal resection); by physical examination in which thickened, tender bowel may be felt; or by imaging studies (e.g., a small bowel barium study showing the absence of the terminal ileum and the presence of strictures, stellate ulcers, or cobble-stoning of the mucosa). Ileal dysfunction secondary to ileal resection is suggested by the presence of diarrhea without steator-rhrea, but it may difficult to differentiate this presentation from the stasis syndrome. Lipid malabsorption would be suggested by an increase in fat in the stool. The loss of bile acids to the colon and thus to the enterohepat-ic circulation can be associated with no or minimal steatorrhea. With more extensive (100 cm or greater) ileal resection, however, the diarrhea is caused not only by bile acids but also by malabsorbed fatty acids (steatorrhea).71 Thus, the diarrhea associated with Crohn disease may be caused not by active disease but by the results of ileal resection. This scenario is suggested by the finding that the diarrhea occurs when the patient first eats after surgery, a time when disease activity may be low secondary to active disease resection, or by the fact that the patient had no or minimal diarrhea before surgery, with diarrhea becoming more prominent afterward. Because of the stenosis present in some patients with Crohn disease, the stasis syndrome can develop [see Stasis (Bacterial Overgrowth) Syndrome, below]. When the diarrhea is caused by bile acid loss, the treatment is cholestyramine (4 g a.c. and h.s. ).71 This resin preferentially binds the dihydroxylated bile acids, reducing their aqueous concentration and reducing their proportion in the total bile acid pool. Both effects are beneficial. In the case of larger ileal resections in which steatorrhea is prominent, cholestyramine may actually provoke more diarrhea and malabsorption because it reduces the aqueous bile acid concentration in the upper intestine when taken before meals. In this case, medium-chain fatty acids are used as a replacement for the long-chain fatty acids. The results of this strategy are often not as good as desired. Vitamin B12 absorption should also be evaluated in all patients with ileal resection, and if absorption is found to be abnormal, vitamin B12 should be given parenterally. Some patients with severe Crohn disease undergo extensive intestinal resection, resulting effectively in short bowel syndrome. Similarly, patients who have numerous enteroenteric fistulas also have symptoms of short bowel syndrome because the fistulas cause the chyme to bypass large sections of the small intestine. Both types of patients should be treated as if they had short bowel syndrome [see Short Bowel Syndrome, above]. The stasis (bacterial overgrowth) syndrome occurs when intestinal stasis leads to the opportunity for bacteria to proliferate locally. This condition has a multiplicity of causes. The most prominent causes are diabetes, scleroderma, intestinal diverticu-losis, afferent loop of a gastrojejunostomy, and intestinal obstruction caused by strictures, adhesions, or cancer. These disorders may be present years before the development of symptoms. Symptoms may appear in an otherwise stable patient because of the administration of a proton pump inhibitor that reduces gastric acid production, allowing gastric and small bowel overgrowth, or the administration of an opiate that further reduces intestinal motility. Clinical manifestations Symptoms of the stasis syndrome are similar to those of other malabsorptive states and include steatorrhea and anemia. The patient may have vitamin B12 deficiency, which has several causes, including binding of the vitamin to bacteria74,75 and bacterial metabolism of the vitamin to metabolically ineffective metabolites. Folic acid levels are usually high secondary to bacterial production of folate.76 Serum albumin levels may be low secondary to protein-losing enteropathy and remain low for months after adequate treatment. The diagnosis is usually made in a patient with malabsorption in the appropriate clinical setting. Intestinal (usually jejunal) diverticulosis is most often unsuspected until a small bowel x-ray is performed. Laboratory tests Establishing the diagnosis of the stasis syndrome is not simple. The most accurate way is to pass an aspiration tube into the intestine. The fluid must be quantitatively cultured both aerobically and anaerobically. In most cases, more than 105 anaerobes will be found. Alternatively, the noninvasive hydrogen breath test may be used. A high resting hydrogen level or a quick increase in the breath hydrogen in response to a fermentable substrate, such as glucose or lactulose, can be used. Another breath test is the 1 g (14C)-D-xylose test, in which the breath 14CO2 is measured. The first choice of treatment for the stasis syndrome is surgical correction of defects, such as an afferent loop that is harboring bacteria, or a jejunocolic fistula. If the surgical option is not available, then recurrent dosing of an antibiotic is required. Tetracy-cline, at a dosage of 1 to 2 g/day for a 7- to 10-day course, gives good results, or another antibiotic that is active against anaerobic bacteria may be used (e.g., trimethoprim-sulfamethoxazole, one double-strength tablet b.i.d.). The patient will need to be re-treated if clinical symptoms reappear, or the patient can receive treatment for 1 week every month. The intestine is often involved in patients with systemic amyloidosis, especially if they have polyneuropathy. In patients older than 85 years, 36% have intestinal involvement with amyloidosis,77 although most are asymptomatic. Endo-scopically, mucosal erosion, friability, or polypoid protrusions can be seen.78 The diagnosis is made by either full-thickness or peroral intestinal biopsies. If a peroral biopsy is performed, it must be deep enough to have arteries visible, so that amyloid, if present, can be demonstrated. Congo red-stained arterioles that become apple green under polarized light confirm the diagnosis. Small bowel follow-through x-rays may show swollen intestinal plicae, possibly with separated loops of bowel. If steatorrhea is present, it may be the result either of bacterial overgrowth caused by intestinal dysmotility or of impaired bile acid absorption.79 No specific effective therapy is available. If bacterial overgrowth is present, then appropriate antibiotics should be given. Excess histamine is excreted into the urine in excess in approximately 75% of patients, making the urinary excretion test useful for diagnostic purposes.80 The urinary excretion of a metabolite of prostaglandin D2 from mast cells may be an even better test.81 X-ray studies of the small intestine may show thickened folds or nodulation. These findings are not diagnostic but may point to a diseased small bowel. Histamine-mediated overproduction of gastric acid may lead to peptic ulceration. In that event, H2 receptor blockers or proton pump inhibitors are effective in controlling symptoms. In the skin, urticaria pigmentosa may be effectively treated with H1 receptor antagonists such as diphenhydramine (25 ^.g every 6 to 8 hours). If diarrhea persists, cromolyn sodium may be given at a dosage of 100 mg orally four times a day. Most chronic pancreatitis is caused by alcoholism. In rare cases, the disease is inherited. Patients experience weight loss resulting from malabsorption of food. Malabsorption caused by pancreatitis is discussed elsewhere [see 4:5 Diseases of the Pancreas]. One of the consequences of gastric surgery is steatorrhea, primarily in patients who have the Billroth II gastric resection with a gastrojejunostomy. In this operation, the antrum and a variable portion of the body of the stomach are resected, the stomach is sutured closed, and a gastrojejunostomy is created. Thus, food bypasses the duodenum and most proximal jejunum, which are the sites of maximal cholecystokinin and se-cretin concentrations and the active sites for folate, calcium, and iron absorption. Approximately one half of patients who have undergone the Billroth II procedure have steatorrhea of 10 to 15 g of fat/day. This condition is thought to result from food entering the jejunum without the hormone-sensitive sites in the duodenum receiving the appropriate signals for hormone release. Thus, there is poor gallbladder contraction and reduced release of pancreatic digestive enzymes to the intestine resulting in poor admixing of the chyme with pancreatic enzymes and bile acids. The afferent loop, which drains the duodenum and proximal jejunum, may become blocked or atonic and harbor bacteria. The stasis syndrome may occur if enough bacteria are present. Because of their small stomachs, the affected patients cannot eat as much as they previously could. This decrease in food consumption, in combination with steator-rhea, causes many patients who undergo the Billroth II procedure to stabilize at a lower weight than they were before surgery. Osteopenia and iron deficiency anemia are also found. Constant small amounts of blood loss from the gastric ostomy site combined with impaired iron absorption contribute to the iron-deficient state, which is the most common form of anemia. Folate deficiency secondary to the inability to generate ab-sorbable monoglutamyl folate from nonabsorbable heptaglu-tamyl folate (the common form of folate found in the diet) is also found.82 Least commonly seen is vitamin B12 deficiency caused by hypochlorhydria and resection of intrinsic factor-containing gastric parietal cells. Treatment of the steatorrhea is usually not necessary, because it is not clinically significant. Iron, calcium, or vitamin B12 and folic acid must be replaced as indicated. If the patient has early satiety, multiple small meals may be efficacious. Symptoms of GSE may develop in patients after gastric surgery.83 It is likely that these patients had clinically silent GSE before the operation. The operation itself causes modest stea-torrhea (10 to 15 g fat/day) in 50% of cases, even in patients whose intestine is otherwise normal. In the previously compensated GSE patient, however, surgery is enough to cause clinical symptomatology. Therefore, if postgastrectomy patients exhibit excessive steatorrhea, an evaluation for GSE is warranted. Inflammatory bowel disease that develops in patients after gastrectomy may likewise be an indication of the presence of previously silent GSE.